In New York, concerned community members are calling for justice in the matter Qingyou Li, a 64-year-old man who faces assault charges after an altercation with a couple on the street in Flushing last month. The incident seems to have been set off by a minor accident and exacerbated by miscommunication. Mr. Li, who does not speak English and is mostly blind in one eye, was walking on the sidewalk and passed a couple walking a dog, when he accidentally tripped over the leash, causing the dog to bark. Mr. Li attempted to apologize, but the dog's owner began cursing at him and altercation ensued. That's when things turned violent. According to Mr. Li's account, the man struck him in his left eye and beat him, shoving him into a nearby fence. The woman also jumped into the fray and bit Mr. Li's hand. (WTF?) Mr. Li says he instinctively swung his hand to shove her away from him, but the woman claims he struck her in the face. On December 14, 2014, Mr. Li was walking alone on a sidewalk in Flushing when he accidentally tripped over a dog’s leash, causing the dog to bark. Mr. Li attempted to apologize, but the young man with the dog began cursing at Mr. Li and an altercation ensued. Mr. Li claims the taller and bigger young man struck him in his left eye and continued to beat him, shoving him into a nearby fence and forcing him to his knees. As Mr. Li was trying to prevent injury to his good eye (the right eye), a young woman with the man bit Mr. Li's hand. Mr. Li instinctively swung his hand back to keep the young woman away from him, but the young woman claims Mr. Li struck her in the face. Mr. Li asserts she then kicked him in his head and body, while the man continued to beat him. Both EMS and the police arrived, but neither provided Mr. Li with an interpreter. Mr. Li called his brother-in-law who is an American-born Caucasian, fluent in both English and Mandarin, to relay Mr. Li's account of what transpired. However, the commanding officer refused to allow him to translate in full Mr. Li’s story. 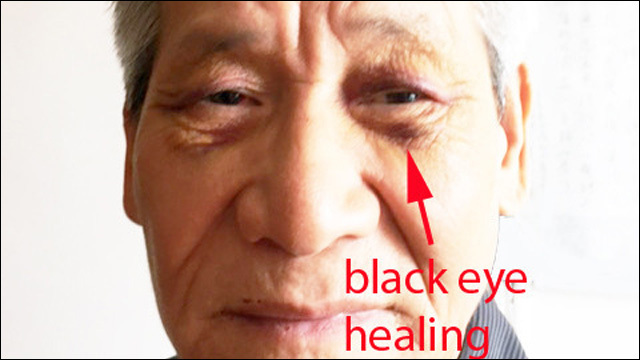 Despite Mr. Li's account and the visible injuries to Mr. Li's eyes, face, shoulder, leg, and hand, the commanding officer ordered Mr. Li to be arrested. At the precinct, Mr. Li was detained for two hours, during which time, no interpreter was provided and no explanation given as to why he was arrested. Charged with assault, Mr. Li was given a desk appearance ticket to appear in court on January 9, 2015. This online petition to the Queens County District Attorney, started by a coalition of local Asian American community organizations, demands that all charges against Mr. Li be dropped immediately.